On Tuesday, February 26th, we can elect a new mayor in Chicago. 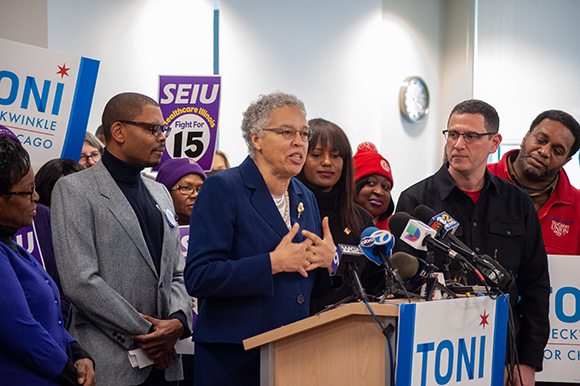 Toni Preckwinkle has earned our endorsement by standing with our striking workers, supporting a $15 minimum wage, reforming our justice system, and fighting for affordable healthcare and housing. 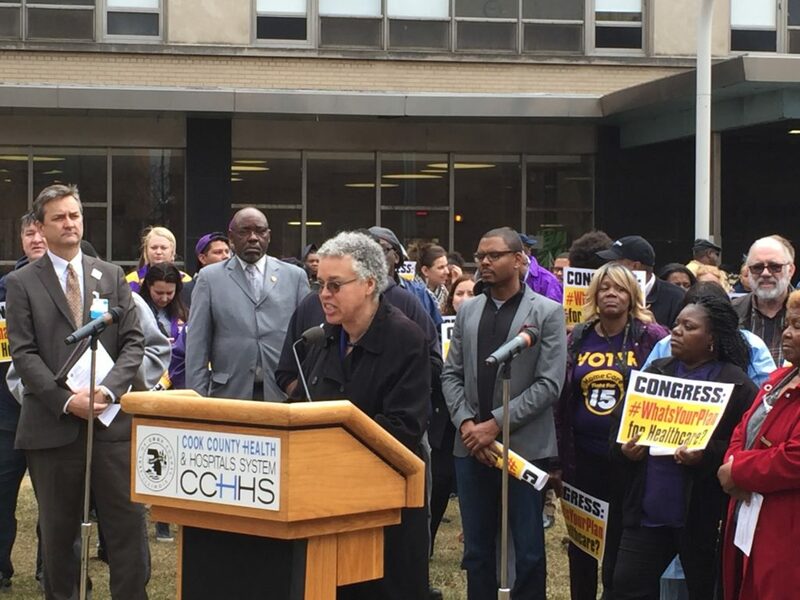 When it’s mattered most, Toni Preckwinkle has always been there for working people. She’s a former Chicago Public Schools teacher who has been breaking down barriers her entire career. The success of people of color and women in the 2018 election shows that change is possible. 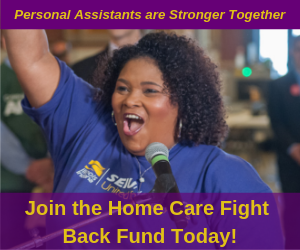 Because SEIU members turned out in force last year, we were able to take back the U.S. House of Representatives, make Bruce Rauner a one-term governor, and added representatives in the state legislature who support working families. 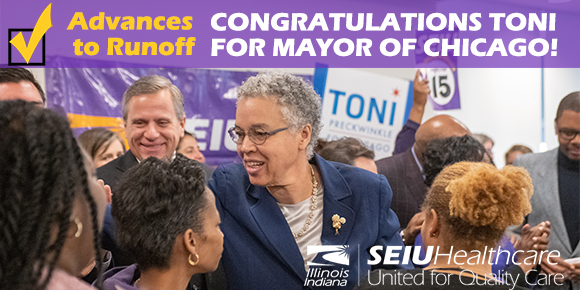 We can build on our victories in February by voting for Toni Preckwinkle for Mayor. The Old Boys Club is on the run and on the way out. We all need to do our part to finish the job in Chicago. Our votes really can make the difference in creating a safer, fairer and stronger city that works for everyone, not just the well-connected. 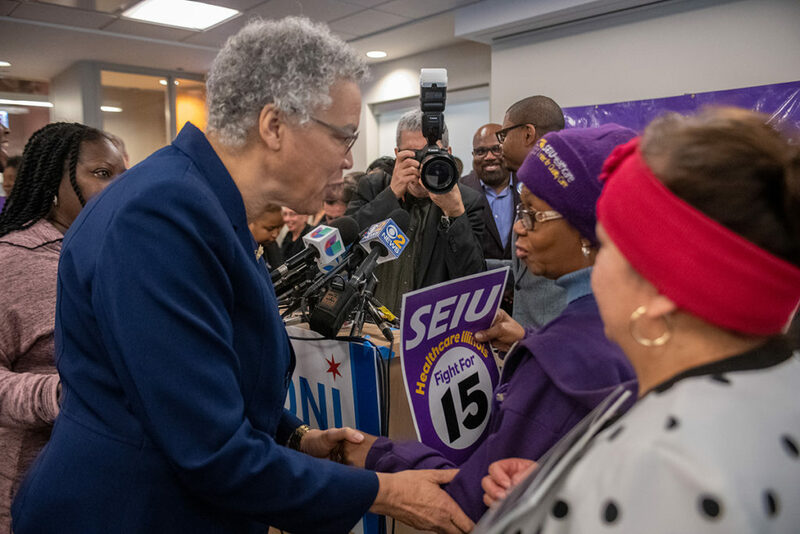 When the “MADO 8,” SEIU workers at the MADO mental health facility in Buena Park went on strike, Toni Preckwinkle joined them on the strike line in sub-zero temperatures. Learn more. 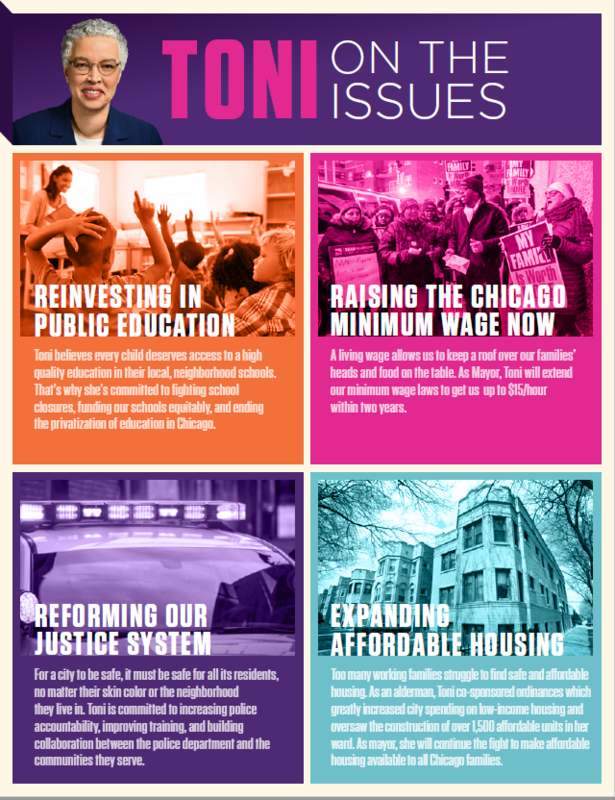 Toni is the ONLY candidate for mayor with a plan to raise the minimum wage to $15. She has proposed an extension of the city’s minimum wage law with 50 cents increases every six months until the wage reaches $15 an hour. That will take the city’s minimum wage to $15 an hour no later than July 2021 and possibly earlier when the COLA is factored in. Before Toni became President, the Cook County Jail detained over 10,000 people every day, the overwhelming majority for pre-trial detention (and mostly for nonviolent offenses). As a result of her efforts, the jail population has declined by over 30% since she took office. Learn more about her record on criminal justice reform. Toni co-sponsored the Affordable Housing ordinances (in 1993 and 1998) that resulted in a 50% increase in spending on low and moderate-income housing. As Alderman, she oversaw the construction or rehabilitation of over 1,500 affordable housing units in her ward. 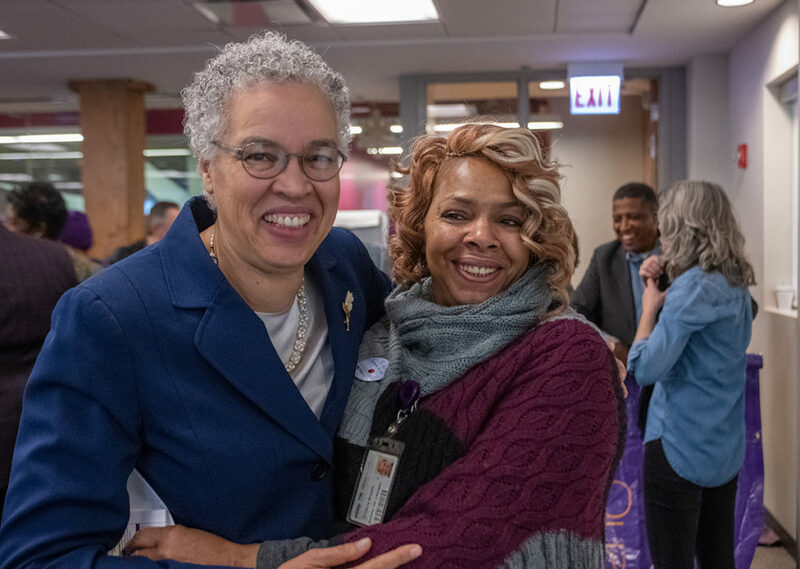 As Cook County President, Toni Preckwinkle has led a massive reduction of uninsured through the CountyCare program and expanded health services for the under-served and uninsured. 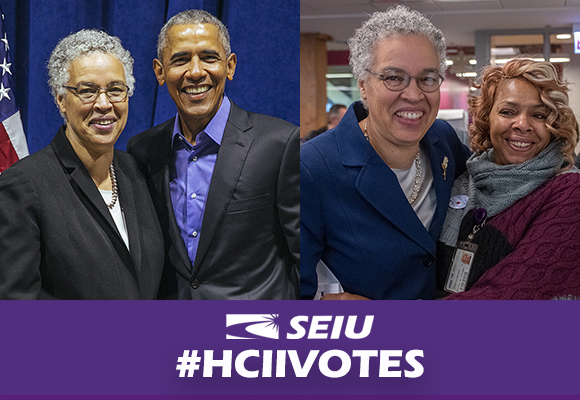 She stood with SEIU members and other allies to fight against Trump’s attacks on our healthcare. Learn more about other important city races and when and where to vote on our elections page.